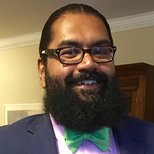 Manny Patole is an independent consultant specializing in international development, water, and data governance. He earned a master’s of urban planning from NYU and a LLm/ME in water governance and conflict resolution from the University of Dundee and UNESCO-IHE. Patole's research interests include localization, data disaggregation, environmental gentrification, transboundary water governance and WATSAN for urban poor.